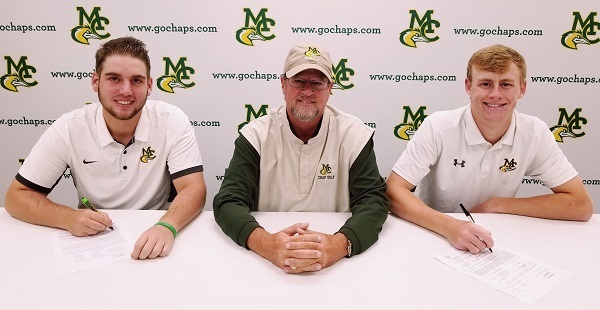 MIDLAND, TEXAS - Alex Motes (left), a sophomore from Sulpher Springs, Texas, and NJCAA Championship All Tournament team member, has signed with D2 traditional golf powerhouse Oklahoma Christian. Callum Bruce (right), a sophomore from, Banff, Scotland and reigning NJCAA Player of the Year, has signed with D1 traditional golf powerhouse San Diego State University. Midland College Chaparral Golf coach Walt Williams (center) proudly looks on!